Patients with osteopetrosis often present with orthopaedic problems such as frequent fractures. Management of fractures with open reduction and internal fixation is difficult but possible. We report on a 22 year old patient with a medial humeral condyle fracture treated successfully with internal fixation using a pre-contoured plate. In 1904 Albers-Schoenberg described a condition characterised by marked radiographic density of the bones (1). Despite the sclerotic radiographic appearance of the thickened cortices and its material hardness, osteopetrotic bone is weak, brittle and prone to fracture after minor trauma (1). Most literature regarding treatment of osteopetrotic patients with fractures concentrates on paediatric patients or on the difficulty of operative intervention in adults (2). We report the case of an adult patient with osteopetrosis and a low medial column fracture (Milch Type I (1)) of the distal humerus after minor trauma. 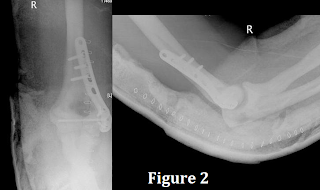 The fracture was treated operatively utilising internal fixation with a pre-contoured peri-articular plate. A 22 year old female with known osteopetrosis presented with an elbow injury after bracing herself with the right arm after a fall. 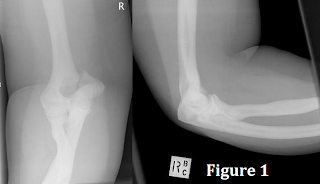 The mechanism described suggested a valgus injury to the right elbow resulting in a Milch Type I (3) low medial column fracture of the distal humerus (Fig. 1). There were no neurological deficits. As an adolescent she had previous injuries including one to the radius of the same side limiting elbow extension by twenty degrees. She was also partially blind and was receiving psychiatric treatment for depression. Two days later, open reduction of the right distal humerus was performed with internal fixation using a pre-contoured medial condylar locking plate (Fig 2). This was done through a posterior approach after identifying the ulnar nerve. Anterior transposition of the ulnar nerve was done before closure. The patient was discharged two days later in a plaster-of-paris back slab with outpatient follow-up. After two weeks the arm was placed in a range of movement elbow brace with unrestricted range of motion. Serial radiographs were performed at four-weekly intervals and complete bony union with disappearance of the fracture line was evident on the radiographs taken at fourteen weeks (Fig 3). Outpatient as well as a home-based physiotherapy program was arranged and full pre-injury range of motion was achieved by ten weeks. Osteopetrosis is a rare hereditary disease of the osteoclasts first described by Albers-Schönberg, a German radiologist, in 1904. Defective osteoclastic activity or a reduced number of osteoclasts results in a failure of bone remodelling (4). This is manifested on radiographs as an increase in bone mass and osteosclerotic changes (4). Osteopetrosis can be classified into three main forms: a malignant autosomal recessive, intermediate autosomal recessive and benign autosomal dominant form; the vast majority of these cases are the benign autosomal dominant form. The malignant autosomal recessive type, also known as infantile, is characterised by growth retardation, failure to thrive and cranial nerve palsies manifesting as proptosis, deafness and blindness. In addition, pancytopenia and thrombocytopenia may result from bone marrow failure. Many features of the intermediate form of osteopetrosis are similar to those of the malignant form but the intermediate form is less severe and later in onset. It is often diagnosed after a fracture, usually occurring in the first decade. Benign osteopetrosis has been further subdivided into types I and II. However, recent genetic studies have shown that autosomal-dominant osteopetrosis type I is caused by an increase in osteoblastic activity rather than osteoclastic dysfunction. In this case osteoblasts deposit excessive amounts of bone matrix (4). Type II autosomal dominant osteopetrosis is the form Albers-Schönberg first described and so is often named after him. The onset is in later childhood and is usually diagnosed incidentally during a radiographic examination (4). It is also associated with increased fracture frequency. Other manifestations include coxa vara, osteoarthritis, spondylolysis, back pain, osteomyelitis and cranial nerve palsies. Radiographic features include skull-base thickening, vertebral end-plate thickening and endobone appearance (4). Isolated medial condylar fractures of the humerus in adults are uncommon and we have not discovered a report of this fracture in an osteopetrotic patient. Medial condylar fractures are intra-articular and like lateral condylar fractures are prone to non-union (1). Usually, the mechanism for this fracture is through a valgus force on an extended elbow where the force is transmitted via the olecranon or coronoid process into the medial condyle (3). The fracture can also arise from an avulsion injury of the condyle through forceful contraction of the forearm flexors. With minimally displaced fractures of the medial humeral condyle, good fracture healing and functional outcomes can be expected with non-surgical treatment consisting of immobilisation in a splint and a gradually increasing permissible range of motion (7). On the other hand, studies specifically examining displaced medial humeral condylar fractures treated by open reduction internal fixation reported good or excellent outcome in 86% of patients (2). As mentioned earlier, patients with osteopetrosis are prone to infections and the reported incidence of post-operative infection is 12% (2). Furthermore, some authors have reported delayed and non-union following fractures in osteopetrotic patients (2). A study has shown fracture healing time in osteopetrotic mice to be more than twice as long (2). Despite the difficulties of surgery, the risk of infection, and the higher incidence of delayed and non-union, the patient achieved an excellent functional outcome with no surgical complications. 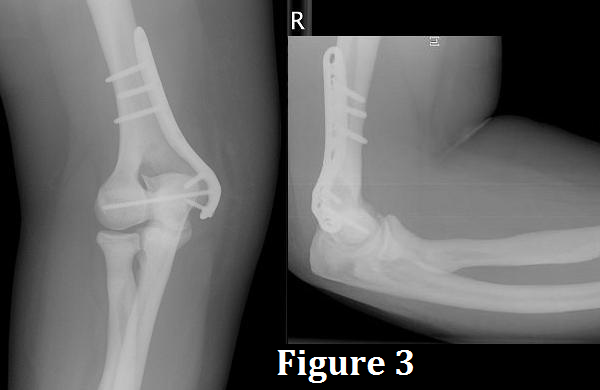 Open reduction and internal fixation to a fractured medial humeral condyle in a young osteopetrotic patient is certainly an option. 1. Albers-Schönberg H. Roentgenbilder einer seltenen Knochennerkrankung. Munch Med Wochenschr 1904;51:365. 2. Armstrong DG, Newfield JT, Gillespie R. Orthopedic management of osteopetrosis: results of a survey and review of the literature. J Pediatr Orthop 1999;19:122–132. 3. Milch H. Fractures and fracture dislocations of the humeral condyles. J Trauma 1964;15:592-607. 4. Tolar J, Teitelbaum SL, Orchard PJ. Osteopetrosis. N Engl J Med 2004; 351:2839-2849. 5. Abe S, Watanabe H, Hirayama A, Shibuya E, Hashimoto M, Ide Y. Morphological study of the femur in osteopetrotic (op/op) mice using microcomputed tomography. Br J Radiol 2000;73:1078-82. 6. Bollerslev J, Mosekilde L. Autosomal dominant osteopetrosis. Clin Orthop Relat Res. 1993;294:45-51. 7. El Ghawabi MH. Fracture of the medial condyle of the humerus. J Bone Joint Surg Am 1975;57:677-80. 8. Jupiter JB, Neff U, Regazzoni P, Allgower M. Unicondylar fractures of the distal humerus: an operative approach. J Orthop Trauma 1988;2:102-109. 9. Shapiro F. Osteopetrosis: Current clinical considerations. Clin Orthop Relat Res 1993;294:34-44. 10. Marks SC Jr, Schmidt CJ. Bone Remodeling as an Expression of Altered Phenotype: Studies of Fracture Healing in Untreated and Cured Osteopetrotic Rats. Clin Orthop Relat Res 1970;137:259-264.